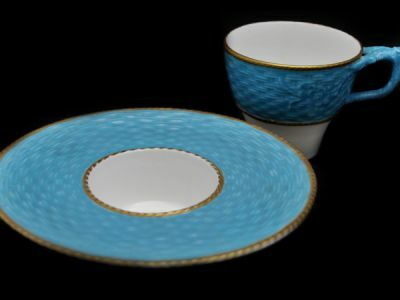 A pale blue, white and gold Bodley trembleuse teacup with its deeply recessed saucer to prevent cup from tipping over. Branch-like handle, basket weave and floral patterned texture. Dates to c.1870 and measures 13.3cms (5.2 inches) across saucer.